for the quilts for my girls who were affected by the Camp Fire. They received them today from school and they are beautiful! My oldest actually lost hers in the fire so this means a lot. Thank you from the bottom of my heart. When the devastating Camp Fire forest fire hit California, the small town of Paradise was directly in its path. Homes and schools were burned to the ground. 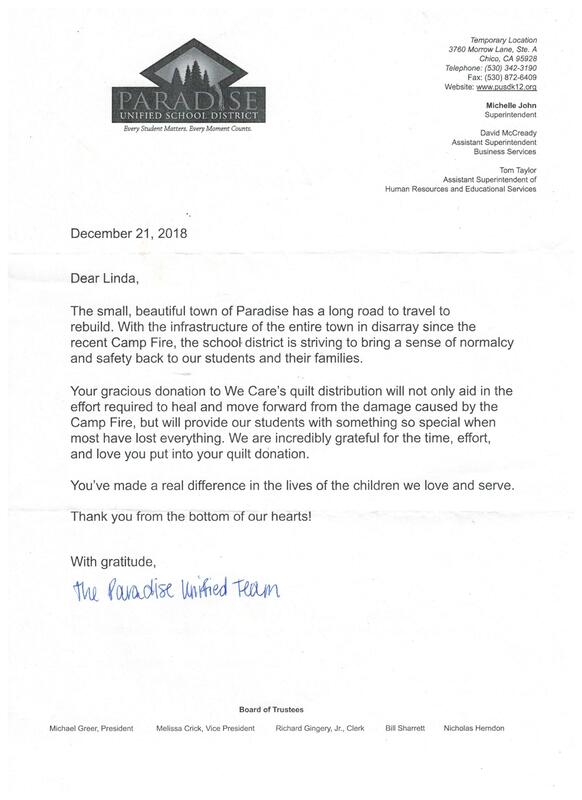 Quilts for Kids was contacted by one of our CA chapters who was working closely with an organization called We Care, distributing quilts to every child in the school district. We are very proud and grateful to have helped. The Medical Staff at Doylestown Hospital Loves QFK! 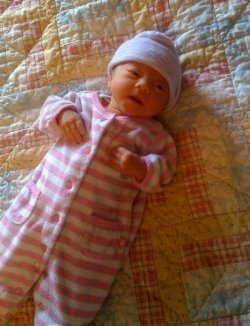 This tiny newborn at Doylestown Hospital in Doylestown, PA, sports her brand-new Quilts for Kids quilt along with a hat that would fit right in at the Derby. Cheryl Sloan, our Waycross, GA, Chapter Leader reports that 45 quilts were delivered by Patsy Sanford to the children's hospital in Savannah last month, including one made by 12-year-old Lex Georvasili, Boy Scout Troop 217, from Kingsland, GA, for his Scout service project. 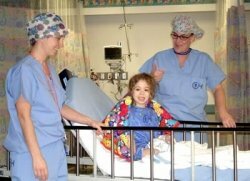 His proud smile is mirrored by the grateful smiles on the faces of Lexie Smith and her parents, who were so touched to receive a quilt prior to her surgery for a spinal tumor and delighted to share the good news that the tumor was benign. 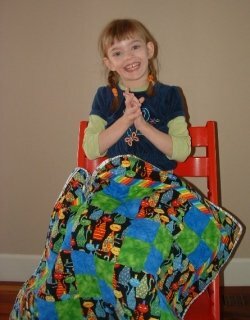 I wanted to say thank you to Quilts for Kids. My son was hospitalized at Dupont Children's Hospital in Wilmington, DE. The quilt he received made him so happy. He's doing much better now and still sleeps with it every night. 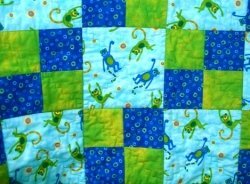 My mom saw how much my son loved his quilt and has already made her first quilt for quilt for kids! They really make a difference! I was able to deliver a few more quilts this weekend at our recent home dedication for our newest, soon-to-be homeowner and was able to snap some photos. While the honored person’s daughter was not able to be in attendance, these daughters of current Habitat homeowners were. They were SO excited! They loved the colors and patterns of their new quilts! Wonderful Volunteers, I wanted to say thank you to you guys for my daughter's quilt. She had a lot of pain after surgery and the quilt helped brighten her stay. It is beautiful as are your hearts. Thank you. “Because Thaddeus was born with several heart defects, he was immediately whisked away to the resuscitation room by a waiting team of doctors, and then to NICU. At 5 days old, Thaddeus underwent a 13-hour open heart surgery. When he woke up in PICU he was lying on his quilt. Unfortunately, due to complications and the number of repairs inside his heart Thaddeus entered complete heart block and required surgery again for a permanent pacemaker. Due to all the cords and IV’s as well as his pain level and incision, we held Thaddeus only once from the moment he was born until the time he was 3 weeks old. 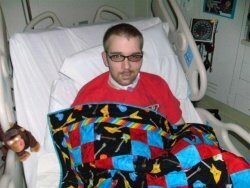 It meant so much to us that he was surrounded by a quilt lovingly made for him during that time. You cannot imagine how comforting it is to have someting special in a hospital environment. 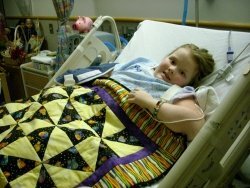 “I would just like to take this opportunity to say “Thank You” for the quilt that was given to my daughter during her stay at the Medical Center of Central Georgia. She absolutely loved it and has used it every day since she has been home. This is a great way to make kids smile while they are in the hospital. Thank you all again so much. 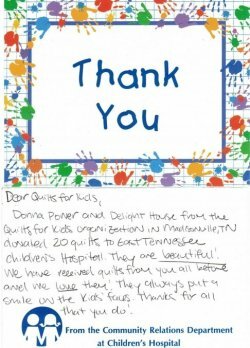 “I wanted to send a well deserved “thank you” to Quilts for Kids and all the volunteer quilters. I had my multiple back surgeries in December of 2009/2010 when I was 23 at Children’s Hospital of Philadelphia. I remember waking up from one of my three back surgeries of the week and a nurse laying a beautiful quilt on me. 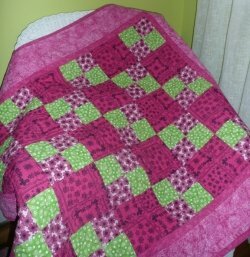 It is a beautiful pink and green quilt with frogs and dragonflies made by an angel named Valerie. I may not be a kid anymore, but I sure felt like one :] It meant so much in such a scary time in my life. To this day it still lays on my bed and reminds me of how wonderful people can be. I cannot tell you enough how much it meant to me that day and how much it still does. Thank you for all you do. If it made a 23 year old’s day, I can’t imagine what it does for younger children! Our thanks to Cheryl Sloan and our wonderful Waycross, Georgia, chapter, just one of our 85 chapters nationwide, making a difference in the lives of children close to home. Thank you so much for the quilt we received for Daniel. It just so happened he has been sick this week. I know this quilt has been a huge comfort for him. He loves to look at the bright colors and feel the quilting thread. 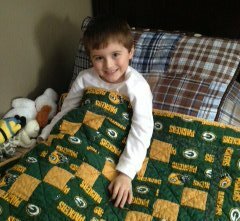 Thank you for your kindness and wanting to help kids like Daniel with the comfort of a quilt. 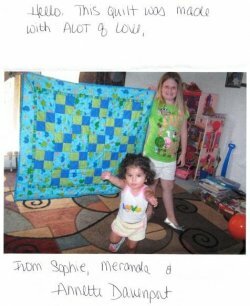 Having been given a heart-breaking diagnosis, one mom takes the time to let us know how much a QFK quilt meant to her family. 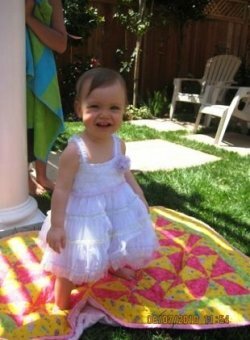 “My 5 month old daughter, was recently hospitalized at (a hospital in New Jersey.) We received a devastating diagnosis on Christmas Day. We were absolutely destroyed. 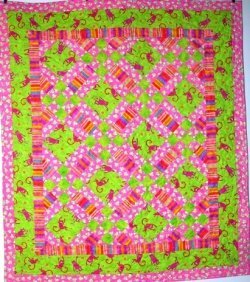 As a holiday gift, she was given a colorful pink monkey quilt. 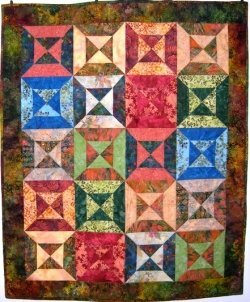 It is a fun, uplifting, happy quilt. She really likes looking at all of the colors. At a time like this it is especially heartwarming to know that people care. Your thoughtfulness and generosity will never be forgotten. I just wanted to say thank you for the wonderful gift we received from your group. Zoey was born on Christmas Eve 5 weeks premature. She did really well despite being so early and spent about a week in NICU. While she was there, one of the nurses pulled me aside and asked me to pick out a quilt for her. It was such a nice gesture for complete strangers to send over such meaningful gifts. All the quilts were so beautifully made, it was so hard to pick one out. I decided on the one with colors that matched her nursery. Just to make sure we know...this note was tucked into a quilt sent to headquarters. 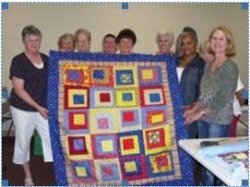 Marie Schlameus, QFK Round Rock Chapter, updates us on the quilts gifted to victims of the recent Texas wildfires. Our family recently was given two quilts made by your organization for our children through The Hideout Christian Learning Center. We lost our home in the Bastrop wildfires, and your donation to our son and daughter touched us deeply. The children ages 7 and 3 were so delighted to have such beautiful quilts to cuddle after loosing their old trusty blankets! So many people have done so much for us and these quilts are so special and just another reminder to us of all the people who have stepped up and helped so many affected by the fire. Thank you for your thoughts and kindness, we appreciate the love so much. “My son had his first surgery this past Friday at New Hanover Regional Medical Center in Wilmington, North Carolina. I found myself nervous about the surgery. I was worried about my little three year old feeling alone and scared in the operating room. Just before being rolled into the operating room, a nurse came in with a quilt for him. 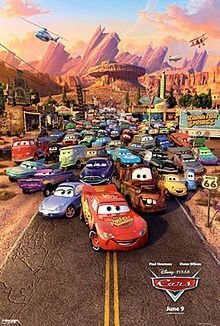 It was a “Cars” quilt, which is perfect, because that is his favorite movie. As soon as he saw “Mater” and “Lightning McQueen” his eyes just lit up. It was just the reassurance I needed. 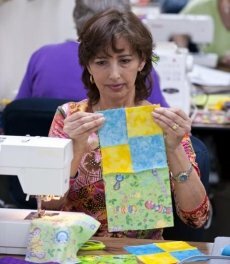 “I want to thank Davie Quilters and all of the volunteers at Quilts for Kids for offering their time, services, and talents to help ease the discomfort of children and their families. Nothing represents warmth and comfort more than a quilt. Thank you do everything you do to enrich the lives of others, especially our children. A quilt is better and more soothing than any drug can ever be. Although none of the emailed thank-you notes included photos, pictured here is a young patient peacefully resting with his quilt from QFK's Baton Rouge chapter. 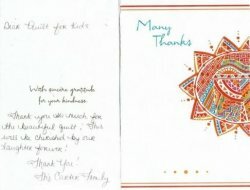 We wanted to share just a few thank you notes, received in the past week. We want to thank you so much for your beautiful quilts that you make! My daughter received one while she was in the hospital for in-patient chemo and she LOVES it! She slept and still sleeps with it daily. It was wonderful to see the smile on her face! Thank you so much for all that you do to bring comfort and smiles to these children’s faces! My son just went in for surgery this Friday. While we where at the hospital, the staff gave my son a hand made quilt from an organization that runs on donated time and materials. I then learned that organization is named “Quilts for Kids”. Your kind gift helped calm and comfort him during his time of need. For that, we are forever thankful. I appreciate the thought and kindness you extended to our family. Thank you from the bottom of my heart! I don’t know who to thank personally, but we just received a gift (a beautiful Winnie the Pooh quilt) from you while in the OR waiting room at CHOP. My son is getting brain surgery today, and the blanket will be comforting to him as he recovers. I want to say thank you from him, until he can tell you himself. So thanks- the kindness really matters. I just wanted to say thank you. Recently my 10-year-old son had to have an emergency appendectomy, and he was really scared. After the procedure the staff at CHOP put one of your adorable quilts on him and he loved it! It really did comfort him. He has a beloved blanket that didn’t come with us to the ER, and your quilt quickly became his safety net. Remember, every time you piece a quilt, finish the binding, pull it out of the dryer and package it up to ship to headquarters, you are helping to comfort these children and their families. 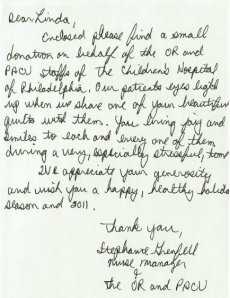 The OR and PACU staffs of the Children’s Hospital of Philadelphia sent a donation along with their thanks on behalf of their young patients. Caring for seriously ill children every day, hospital staff members are finely attuned to what makes their young patients’ days a little less stressful. It means a lot to us at QFK when they tell us that the quilts we deliver bring joy and smiles to every one of them. Their personal holiday donation not only enables us to comfort more children, but also underscores the fact that all of our quilting volunteers really do make a huge difference in the lives of families who are caught up in a life battle with illness. 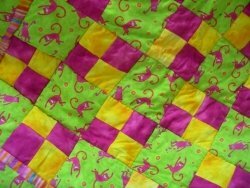 Thank you so much for the beautiful Cat & Mice quilt. We were so touched by these gifts that were given to all the children at the Dravet Syndrome conference. “Cat” is one of the few words that Alexis can say very clearly. She loves her quilt. 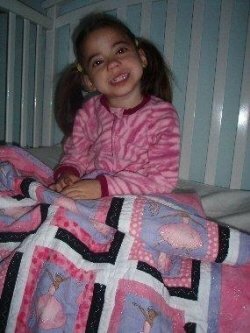 Alexis will be six in January, and she is a very happy and smiley little girl, despite all she has to endure with this awful disorder. Thank you again for this beautiful gift and all your time to make it for someone you don’t even know. We will treasure it always. “I am writing to thank you from the bottom of my heart for the most wonderful gift that was given to my son this past August at The IDEA League conference. The quilt is beautiful and how the quilt made my son feel is beyond words. 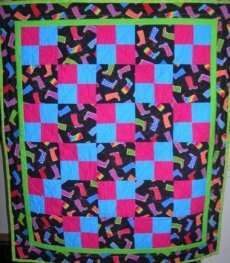 When Brenda handed him his quilt he just lit up and went to each table and showed everyone at the conference his gift. He was and still is so proud of his quilt. QFK receives a personal request. 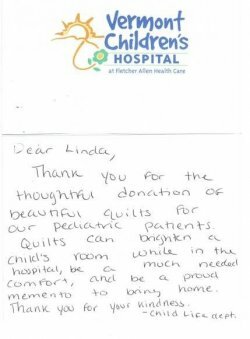 We always tell our wonderful sponsors and generous donors…if you know of a child who needs a quilt, please let us know. Recently, Sunbury Textile Mill did just that. “Thank you so much for the beautiful quilt that you gave to Karson. She loves it! 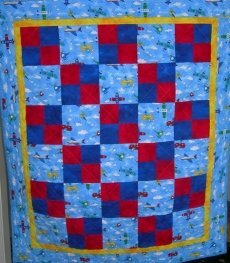 I have never heard of Quilts for Kids before…....thank you for introducing this organization to us! 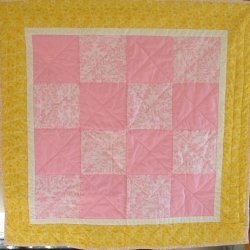 SeBella's pink and yellow QFK quilt has become a happy keepsake for her and her family. Cindy, Chapter Leader in Davis, CA, recently received a truly heart-felt donation. “Hello. My name is Kim. My new daughter SeBella and I were in the UCD NICU almost one year ago. During our stay we were invited to pick a quilt through the Downy Touch of Comfort program. That beautiful quilt lifted my spirits during a very tough time. It was so nice to have an unexpected treat when things seemed so dire. I swore that if we ever got out of that hospital, I would donate every year on my daughter’s birthday as a way to give back and hopefully put an unexpected smile on the face of someone else so they could take their minds off their sick child if even for five minutes. QFK donated a box of quilts recently to the biannual IDEA League Family conference for children with Dravet Syndrome. Children with Dravet Syndrome and their families face daily challenges as they struggle with severe epilepsy that does not respond well to treatment. Recently, Quilts for Kids was delighted to send a supply of quilts to the IDEA League conference in Greenwich, Connecticut. They overwhelmed us with their gratitude. Liam wore his quilt like a cape. Zach was thrilleld with his music/guitar-themed quilt. Melorah curled up in the middle of her bed with her special quilt and fell asleep. Six of the quilts went overseas with parents of Dravet kids. A little quilt comfort goes a long way. I will try to find a way to describe the true and heartfelt delight experienced by my HIV nurses when they saw your quilts. Our first group of quilts was delivered to the HIV clinic at Newark Beth Israel Hospital in Newark, New Jersey. 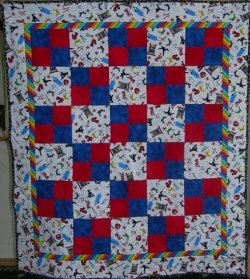 One special quilt will go to a young child who has been taking medications without understanding the reason for them. During the “disclosure” process, this child will learn about HIV disease and how it might impact his life. A little “quilt comfort” will go a long way in helping this child accept this disclosure and develop a new set of coping skills. Thank you so much for your generosity and for sharing your time and talent with nurses, families, and children who are truly appreciative of both! It’s been said that laughter is the best medicine, so we thought we’d pass on this little story from Donna, chapter leader in Victoria, Texas. Needless to say, Mom was perplexed. Later in the day, the pastor stopped by for tea so Mom asked him what that morning’s Sunday School lesson was about. 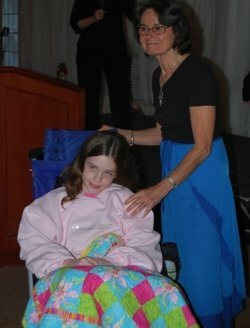 Children at the International Dravet Syndrome Epilepsy Action (IDEA) League conference in Connecticut loved their quilts. 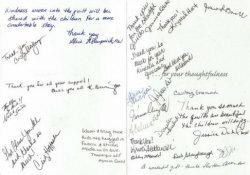 QFK Columbiana Chapter Leader, Agnes Pool, passed on a thank-you letter from The King’s Ranch and Hannah Homes. Nora found a quilt in her favorite colors. The Quilts are fabulous. It means so much to the parents to get these precious quilts. 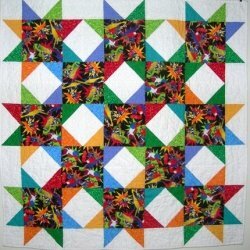 Please let Quilts for Kids know how much we appreciate them! A heartfelt thank you from a young mother in Pennsylvania reminds us why we do what we do…turn tears into smiles for, not just a seriously ill child, but an entire family. “Hi, my name is Amy, and my 2-week old son, Aiden, was born at Children’s Hospital of Philadelphia (CHOP) on Father’s Day. He was born with a serious birth defect. The hardest part of this whole thing was having to go home from the hospital without him and not even being able to hold him yet. Today he had his first surgery and when he was finished, the nurse asked me his favorite color….I said “blue I guess.” She said she had a wonderful present waiting for him when he came out of surgery. 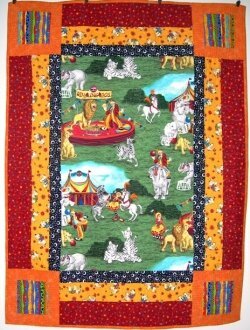 I was shocked when she came out with the most beautiful quilt with monkey’s and moons on it. It was perfect! It really brought a smile to my face. 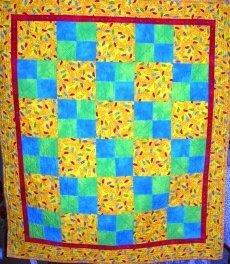 I wanted to write to please have you thank Janet B. for making this beautiful quilt for Aiden. He will cherish it forever and it will bring me wonderful memories of a day that I was so upset to have my first child go into surgery all alone without his mommy there. 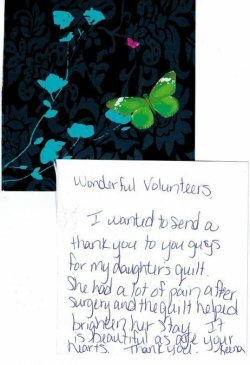 We did have the volunteer quilter’s name on file and were able to pass on Amy’s gratitude. All of you make such a difference in so many lives, and we thank you. 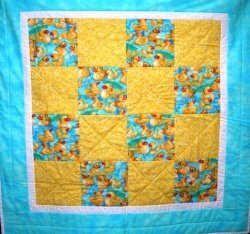 Another pirate quilt waits to be sent out to a hospitalized child whose family needs comfort. Long hours of surgery at CHOP were made a little easier with the gift of a quilt. “Wednesday, June 23 our son underwent a longer than expected and extensive, albeit planned surgery. While we entered into the 11th hour of surgery, our minds grew weary and our hearts saddened. The nurse came out to the waiting room at 9:00p.m. with the last update before she headed home. Samuel was being closed up and they should be done in about an hour. She had two quilts in her hand and she said they were Quilts for Kids and we should select one we felt our son would like. 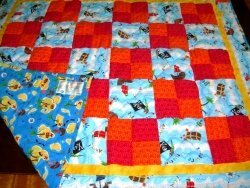 Given the choice, my husband chose a brightly colored pirate themed quilt. 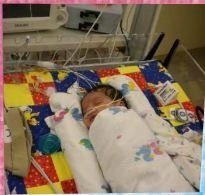 I held onto that quilt tightly in my arms, running my fingers over the fabric, pressing it close to me and covering myself with it while the surgeon finished Samuel’s surgery 12 hours after it had begun. 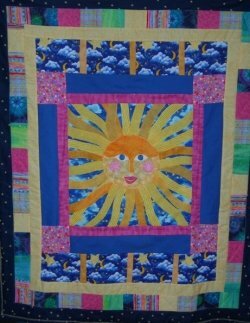 He is currently recovering at Children’s Hospital of Philadelphia and this wonderfully cheerful quilt is proudly draped across his bed reminding us of the warm heart someone had and the love that no doubt went into each stitch. 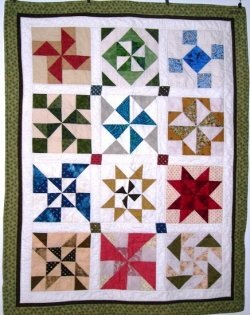 So, please, please, if there is any way to track down the quilter, kindly let Grace K. know that the pirate quilt she made brought comfort not only to a child recuperating, but also to his anxious mother. Thank you for these kind gestures. Hopefully, you will never have to be on the receiving end of such a quilt. Please know how much we deeply appreciate this act of kindness. Coldspring, TX, Quilts For Kids gifted one of their quilts to a beautiful little 4 year old angel, Kensley. She is currently receiving chemo treatments for Acute Lymphoblastic Leukemia. 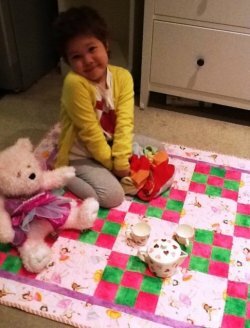 Kensley's Mom, Christina, wrote "Kensley absolutely loves this quilt made by your organization. She has slept with it every night since she received it. Thank you for bringing cheer to my little angel!" 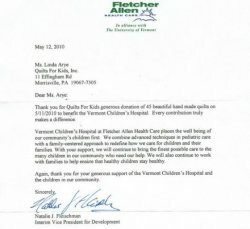 The Child Life Department at Vermont Children’s Hospital appreciates QFK. 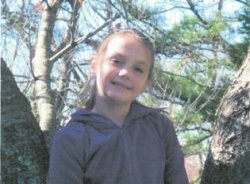 Olivia’s diagnosis of leukemia, although initially devastating, had a happy ending. Below: “Nanny Annie’s” gift to another seriously ill child. 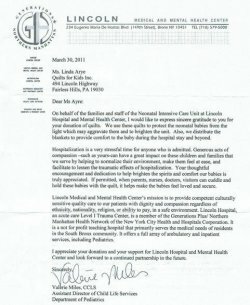 Valerie Miles, Child Life Services, Lincoln Hospital in Bronx, NY, writes..."we would like to express sincere gratitude...for the donation of quilts." They were used to cover the NICU incubator beds and given to new mothers whose newborns had been admitted into the NICU. .."With your support we will continue to bring the finest possible care to the many children in our community who need our help." 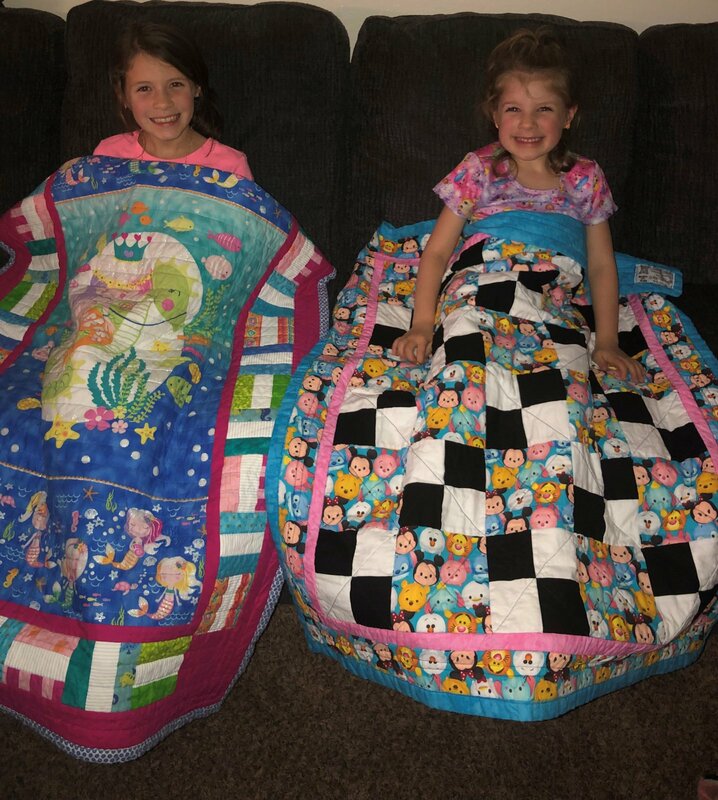 "Warm and snugged these kids are hugged..."
The staff at Chambersburg Hospital in Chambersburg, Pennsylvania, was overjoyed to be able to give QFK quilts to the children under their care. Taking care of their young patients’ physical needs is only part of nursing; Giving comfort makes a huge difference in their recovery. 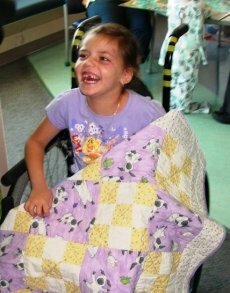 When some of our volunteers ask just why the QFK quilts are sized the way they are, we explain that careful thought went into just what size quilt would work with hospital equipment and wheelchairs…for kids of all ages. 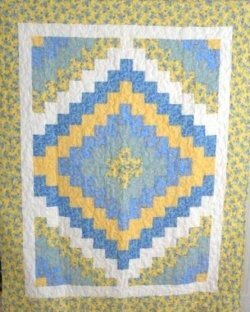 Thank you, Barbara, for taking the time to let us know that QFK quilts are just right! Every single thank-you note warms our hearts. 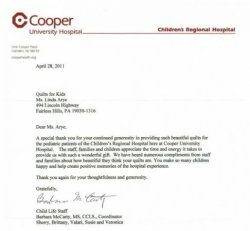 Sometimes the “thank-you” notes are typed on letterhead; sometimes they’re emailed with photos of smiling young patients. Sometimes a nurse takes the time to sit down and jot a note to let us know how the kids appreciate their quilts. And sometimes the kids, themselves, feel well enough to write a special note to us. In every instance, we learn more about how these wonderful quilts make a difference in families’ lives. The reason these letters and notes appear on this website is to let you know how widespread your goodwill can be. The generosity of QFK donors and quilters is unmatched, and we at headquarters thank you all. You are turning tears into smiles every day. 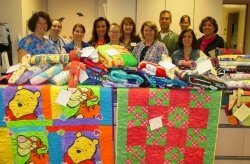 The kids in intensive care especially appreciated the generosity and thoughtfulness of all of our caring quilting volunteers. Director of Volunteer Services, Robin Armstrong, writes..."We appreciate the sharing of your time and talent in the handmade gifts...Your commitment and dedication...truly makes a difference in our patients' lives." 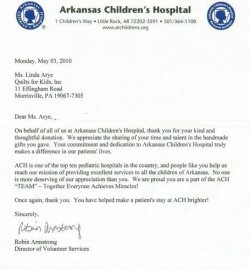 One of the top ten pediatric hospitals in the country, Arkansas Children’s Hospital is on a mission to provide excellent services to all the children in Arkansas, and Quilts for Kids is proud to help. 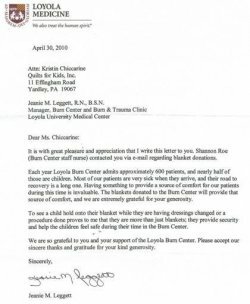 Burn Center Manager, Jeanie Leggett, writes..."To see a child hold onto their blanket while they are having dressings changed or a procedure done proves to me that they are more than just blankets; they provide security and help the children feel safe..."
Each year Loyola Burn Center (IL) admits approximately 600 patients, and nearly half of those are children. Their road to recovery is long and painful, so having something so hold on to for comfort during this time is invaluable. 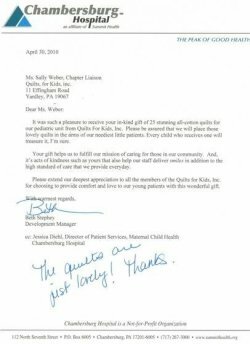 "Please extend our deepest appreciation to all the members of Quilts for Kids, Inc. for choosing to provide comfort and love to our young patients with this wonderful gift." 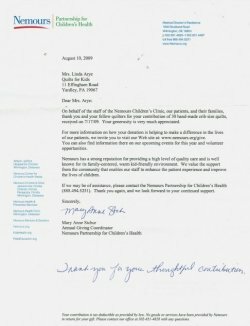 It is tremendously gratifying to us here at headquarters to receive letters of thanks from the hospitals all over the country who receive our quilts. Knowing that the children are touched by the efforts of our volunteers spurs us on to keep expanding our organization so that the Quilts for Kids staff, chapters and volunteers can put more and more cuddly quilts into the hands of the children who need them. 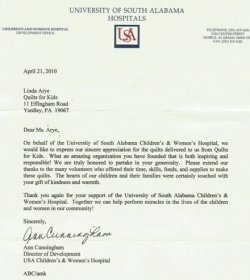 Ann Cunnningham, Director of Development at University of South Alabama Children's and Women's Hospital, writes..."Please extend our thanks to the many volunteers who offered their time, skills, funds and supplies to make these quilts. The hearts of our children and their families were certainly touched with your gift of kindness and warmth." Tori Spradlin, Director of Development at Arnold Palmer Hospital for Children writes..."Your gift will bring joy to our youngest and most vulnerable patients and put smiles on their faces ..."
Child Life Specialist, John Sladewski, writes, "It is clear that each of your quilters puts a great deal of time and love into each quilt...Your donation has already helped bring joy to a number of patients and families..."
“I wanted to thank you for the wonderful job you guys did on the quilts my son used during his short 3 weeks of life at Geisinger Medical Center in Danville, PA. My son was 6 days old when he underwent 8 hours of open heart surgery. Two weeks after the surgery they were able to close his chest, and I joked that he had a pirate scar. I would tell him not to worry chicks dig scars. The nurses thought it would be cute to use a quilt made by your organization with treasure maps and chests all over it. It was a wonderful quilt. Two days after closing Chase’s chest he passed away. I really wanted to express my gratitude to your organization because for the 3 weeks of stress, and frustration that my family and I underwent it was something to make us smile. 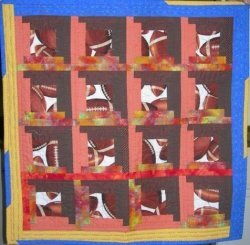 Teresa's football fabric makes the perfect quilt for a young sports enthusiast. 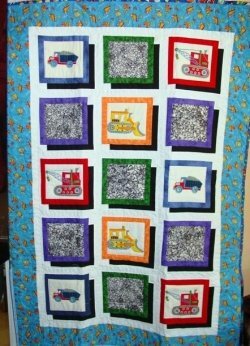 Teresa C. of Houston, Texas, quilts for seriously ill kids in honor of her brother who passed away in 1996 after a life-long battle with cancer. 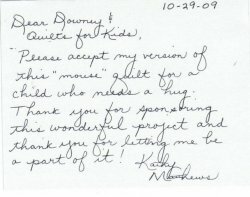 Teresa sent us a note when she returned her two wonderful quilts, one from a kit and the other from her stash, to explain how the Downy Touch of Comfort Program touched her heart. Thank you, Teresa, for honoring your brother’s memory and for comforting two more children who need your kind thoughts and good wishes. During her hospital stay at All Children’s Hospital in St. Petersburg, 10th grader Kyleigh’s most prized possession of all was the maroon and tan quilt given to her while she was in intensive care. Sharon, Kyleigh’s mom, wrote to tell us about her ordeal and to let us know that quilting is a tradition in her family, Indeed, Kyleigh herself has made many quilts and given them to others, so when an undiscovered cardiac birth defect sent her from the soccer field to All Children’s Hospital, she was delighted to receive a quilt that she could hold onto when times got tough. And get tough they did. The diagnosis of ventricular tachycardia took away the uncertainty and the fear of not knowing what was happening, and surgery was scheduled. Happily, after a 7-1/2 hour procedure to repair her heart, Kyleigh was back on the soccer field, wearing a heart monitor at first, and playing with her team. 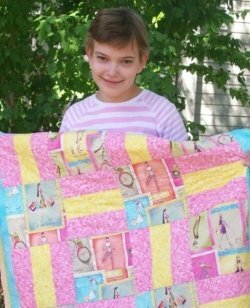 In keeping with the generous nature of quilters, Sharon and her craft group, the “Tea Bags,” made ten beautiful quilts from their stash in honor of Kyleigh, so that ten more seriously ill children will be able to hold onto a special quilt. Our thanks go out to Sharon, Judy, Tina, Sharlene, Maria and Louise…and of course, Kyleigh. 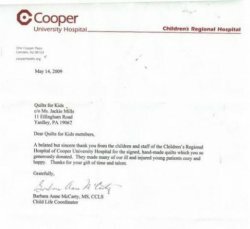 A note from Cathy Kellerman, Director of Donor Relations at Nationwide Children’s Hospital, reinforces our committment at Quilts for Kids to try to wrap every hospitalized child in a colorful, hand-made quilt. She lets us know that, along with hospitals all over the country, they serve ...“thousands of patients each year and ...appreciate the concern and commitment…” from QFK. Thanks to all of our dedicated volunteers, who quilt every project with love, without knowing who will receive that special gift. 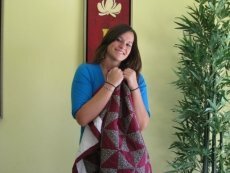 Volunteer Micki was preparing to send a quilt to QFK headquarters when fate chose another recipient. “...(She) said she and a friend were going to visit a girl who was injured in a car accident and as result became quadriplegic. She said it was short notice and didn’t have anything to bring her. I told my mother I would give her the quilt I had just finished. We brought it to Amanda, and it was the very colors of her bedroom, and very much appreciated. 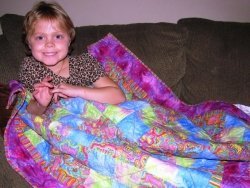 I feel that my time was spent in such a worthwhile way, and I would like to continue to make quilts for children…Amanda was operated on at Shriners Children’s Hospital in Philadelphia. God bless all of you at “Quilts for Kids” for thinking of such a beautiful way to reach out to these children. 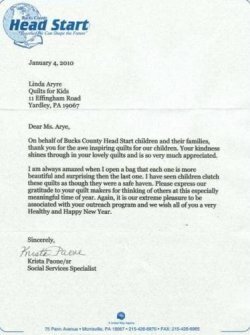 Even though we know that every one of the quilts donated to children by Quilts for Kids is appreciated, it’s always heart-warming to receive notes like the one we got from Stacey T. in Pennsylvania. “We were delighted to accept your donation of beautiful quilts for ‘our’ kids. Each quilt was obviously made with love and care, and those qualities were passed on to the families each time a quilt was given to a child. 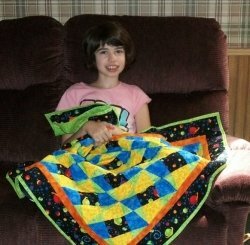 When her daughter received a quilt kit from Quilts for Kids, Penny was so enthused she put together her own creation. 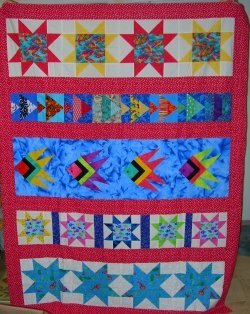 “My daughter Samantha requested a quilt kit a week ago. It arrived here at the house and I called Samantha at college and she explained to me what was inside the package. Today she came home and with my help she sewed her kit together. When I saw the pattern and fabric you had sent, I pulled fabric from my stash and sat along side her to make my own quilt for the kids. 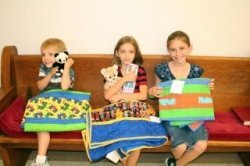 Quilts for Kids Davis Chapter Keeps on Giving! I apologize this “thank you” is coming to you so late, however it most certainly is no less heartfelt. On Behalf of UC Davis Children’s Hospital, the Child Life Department and the children and families we serve, I would like to warmly thank you for the wonderful donation of pajama bottoms and quilts for our patients during the holiday season. We always appreciate donations such as yours beyond words. As you know, being in the hospital can be very difficult for children and their families, especially during the holidays. Our department attempts to reduce the stress associated with the hospital experience. This would not be possible without wonderful donations from kind people like you. The pajama bottom donation has started, what we hope to be, an annual tradition where Santa delivers a new pair of jammies and new quilt to each child in the hospital on Christmas Eve. Fun donations and events like this help to take their mind off their hospital stay, allows them the opportunity to be a child, and gives them the opportunity to go home with some positive memories. 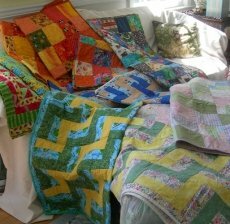 I also want to take the opportunity to thank you for your most recent donation of quilts this past week. 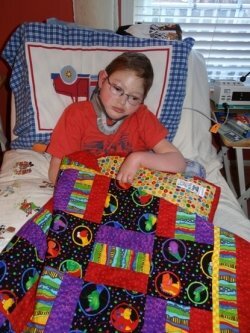 It is such a gift to offer the warmth and comfort of a quilt to a child in the hospital year round. We are incredibly grateful for the ongoing relationship between the Davis Chapter of Quilts for Kids and the UC Davis Child Life Department. Two-year-old Tatianna received her purple QFK quilt as she spent Christmas in the hospital. Numerous trips to the hospital for surgeries are hard on anyone, especially a 2-year-old…and during the holidays, at that. Little Tatianna’s ordeal was made a little better at Christmastime when she received her quilt. Students at H. Frank Carey High School in Franklin Square, New York, learned to quilt in their free time and created a western quilt for a special little cowboy. Along with their academics, a group of students at H. Frank Carey High School in Franklin Square, NY, is learning how to give back. Under the tutelage of Monica Colletti, one of their parents, they’ve learned to knit, crochet and to quilt. 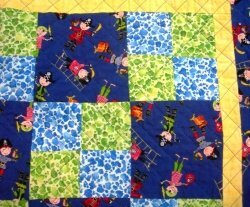 To put their new-found talents to work, they chose Quilts for Kids as their quilting project. 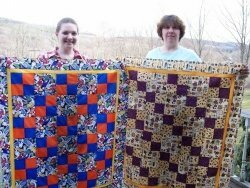 During their personal time, the students dedicated themselves to quilting for children in hospitals, enthusiastically giving of themselves to bring warmth and comfort to children who are ill. These young people have made a difference. Soon this quilt will be wrapped around a child who has enthusiastically chosen it from all the others. 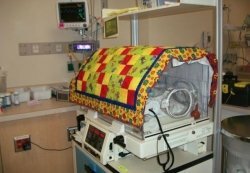 A NICU quilt comes from someone who knows all too well about waiting through anxious days in the hospital. 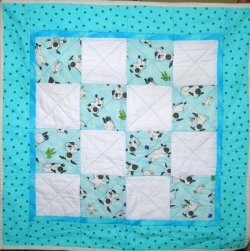 “I made the NICU quilt with the leftover materials from the quilt I had made for my baby girl, Zanna. 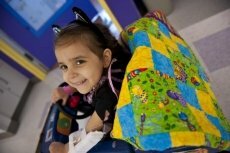 I was touched and very thankful for the quilt Children’s Hospital had given us when we lost her. I wanted to provide a small bit of comfort to someone else going through a hard time. Our 4-year-old daughter Audrey had surgery (her 4th) on Friday. Our whole family was extremely anxious about it because she has complicated airway issues, and we had to postpone the surgery several times due to illness. Everything went well, thanks to the excellent care we receive from Children’s Hospital of Philadelphia. But to add to our relief, we were so touched by the gorgeous ballerina quilt that our awesome anesthesiologist presented to us in recovery. I work for a non-profit, and am an advocate for many others, and I must say that I never envisioned us as the beneficiaries of a non-profit because we blessedly don’t have the financial need that so many other families do. But as I studied the quilt and all the details that so lovingly went into making it, I realized that we really *were* in need of support. We had just gone through a terrible ordeal (on top of the daily stresses we live with), and knowing that there were caring people like you out there was a wonderful comfort. We are so appreciative of your kindness. And how did you know that Audrey loves ballet and takes classes twice a week? I read about Quilts for Kids on your website (what a good idea to include the site address on the label), and I am very impressed with your initiative, creativity and organization. Congratulations, and thank you. Paige’s quilt continues to spread love. “This is a long overdue thank you to one of your volunteers- Jeanette Clark. Last February my special needs daughter, Paige, was in Children’s Hospital of Philadelphia for a same day surgery. 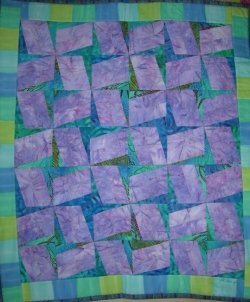 The nurses there gave her a lovely quilt in beautiful shades of purple, her favorite color, to snuggle with and comfort her while she recovered- this was made by Jeanette Clark according to the label. What an amazing gift from someone we don’t even know, my family was deeply touched and Paige felt very special to receive her quilt. Josh’s quilt reminds him of all the good wishes for his recovery. “Josh received his quilt yesterday. Above: Lauren's mom shares her daughter's delight with her new quilt. Below: Volunteer, Linda Hill, pieces together Lauren's quilt. 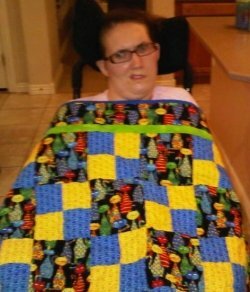 Recuperating from a transplant, Lauren takes her quilt everywhere. Lauren is almost four years old, and loves fireflies and ladybugs, so at a recent workshop in Houston, a volunteer took her enthusiasm to heart, putting together a bright quilt just for her. When she received her quilt Lauren lit up like a firefly on a summer evening. 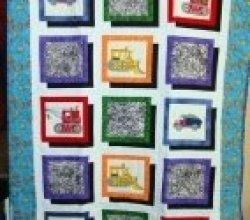 Riding around the hospital floor in her little girl car, Lauren keeps her quilt constantly at her side…it seems to go with her wherever she goes. She loves waving to everyone and saying “BYE” We get the idea that she wants to go home…so we are wishing her all good things, but mostly that she gets well very soon. Hospitalized in Texas, Cade is courageously fighting leukemia. Cade is an avid skateboarder, so when we gifted him a skateboard quilt (made with Timeless Treasure fabric), he could not have been happier. 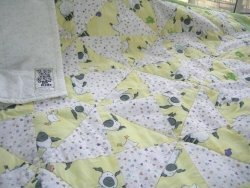 The way the perfect quilt finds the perfect child used to surprise us…now we don’t believe in coincidences. There seems to be a higher power at work. Cade has been hospitalized in Texas for over 3 weeks, putting up a strong fight against leukemia. Our best wishes go out to Cade and his wonderful family. We are so glad we got the chance to make him smile! 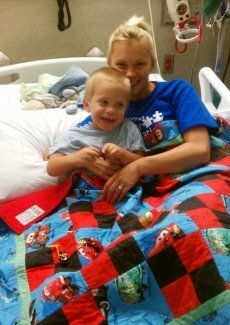 Elijah’s stay at UC Davis Childrens Hospital was made a little easier with his quilt. 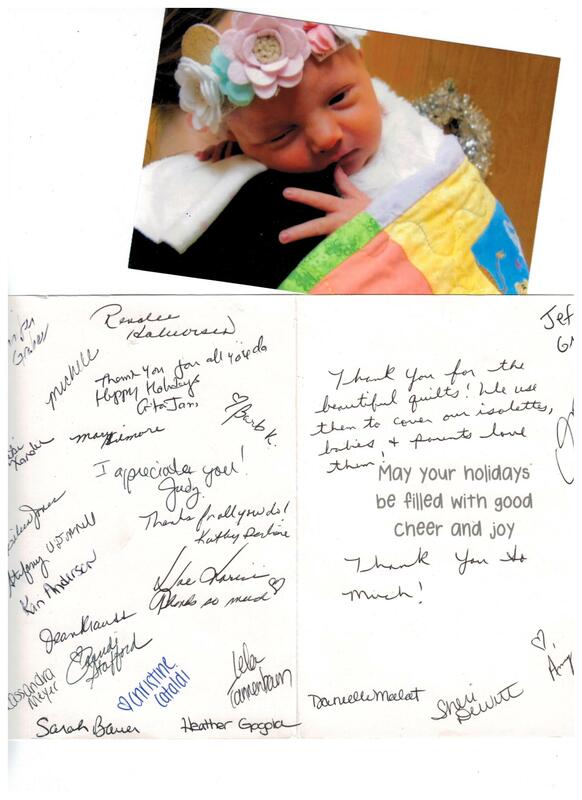 “My son, Elijah, received one of your quilts during his stay at UC Davis Children’s Hospital. I wanted to say thank you. It really helped. We even found one with tractors on it! The quilt helped make a scary, stressful situation much more bearable for both of us. Her quilt was there to comfort Marissa and her family during her passing. 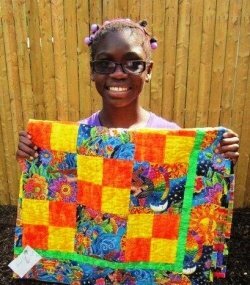 Volunteers carefully chose Marissa’s quilt to reflect her favorite colors. 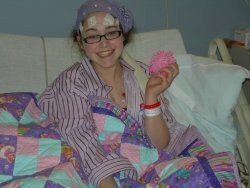 From Akron, Ohio, Marissa has been battling a brain tumor since 2007, but still finds it in her heart to help others, specifically giving away her $5,000 shopping spree from the Make-A-Wish Foundation to benefit others in her community…a shelter for homeless and battered women and an animal shelter. 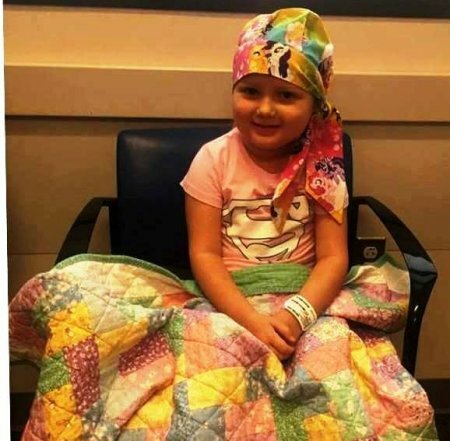 Knowing what it’s like to be hospitalized, she also made sure that other seriously ill children hospitalized for the holidays had teddy bears and gifts. 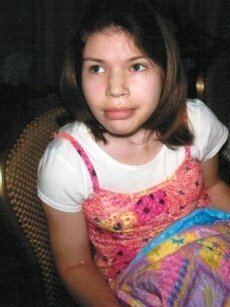 It is with deep regret that I announce the passing of my niece Marissa Alexandra Norwood on Saturday, Dec., 19, 2009. She fought bravely until the end, defying the odds as she battled brain cancer for more than 2 1/2 years. She died peacefully at home surrounded by a host of family and friends. While our hearts are troubled we can rejoice in knowing that her pain and suffering are over and our precious Marissa is in God’s hands. “Thank you for your love, support and prayers. Each of you has been a blessing to my family and me. Child Life Coordinator, Barbara Anne McCarty, thanks Quilts for Kids for the signed, hand-made quilts. 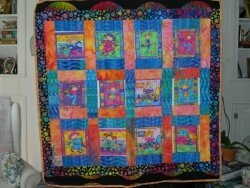 From a quilter with love to a child who needs a hug, this vibrant “mouse” quilt will soon be on its way to comfort a young patient in an area hospital. 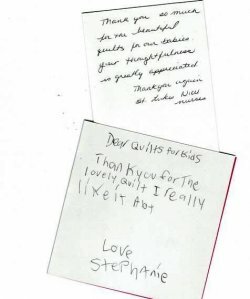 A dad sends a heartfelt thank-you to Quilts for Kids. My wife Donna and I just took our 2yr old, Zoe, to Childrens Hospital in Philadelphia for her 19th surgery. She is doing well and is in great spirits, as usual. You can’t keep a kid down! While on our visit we recieved one of your beautiful quilts while in recovery. Zoe snuggled right up to it and my wife and I loved that she could hold something that wasn’t so hospital-y, if you get my meaning. The nurse who gave her the quilt said we could write to you folks and thank the lady who made it. Her name is Pat Pretty. We’d like to pass along the thanks from Zoe as well. When she came home she fell asleep on the couch with it. The quality of this quilt is fantastic! You can tell a lot of care went into the making. 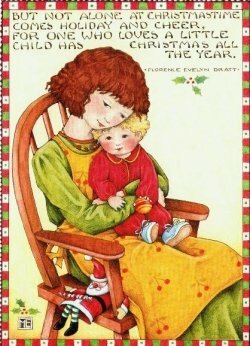 Anyhow, if you could pass along our thanks and a hug to Mrs. Pretty we would greatly appreciate it. Thank you again for you time and stupendous efforts. 30 hand-made crib-sized quilts enhance the warm kid-friendly environment at Nemours Children’s Clinic. I can’t thank you enough for yet another amazing donation of quilts. Your support of UC Davis Children’s Hospital is truly appreciated. We are very fortunate to have your collaboration. The Downy Touch of Comfort event was wonderful. It was well received by the patients and their families. 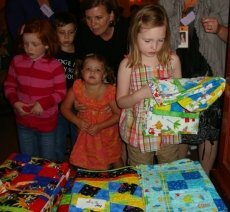 Everyone was thrilled to be able to look through and pick just the right quilt for themselves or their child. Events such as these bring much joy. The smiles on the faces of the patients and families are immeasurable. 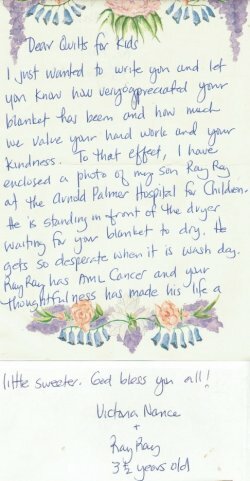 We received a letter from Ray-Ray’s mother thanking us and letting us know how much he loves his quilt. Thank you so much!! I can’t put into words how much Gillian and I both were touched by your gift! I show everyone who has visited us the quilt and they all think it is beautiful - and a wonderful thing to do. I think Gillian would like to try and hand out quilts when she is better. That would be fun. My wife and I were in the pre-op waiting room with our daughter. I was having a difficult time trying to be strong for her because I remembered the feeling of the unknown when I was her age getting ready to go in to the operating room. As her Daddy, I wanted nothing more than to be by her side to keep her safe and to comfort her so that she would know it would be ok. Right before this picture was taken, the nurses came to get her. She was crying, I was crying because she was crying… it was very emotional. As this was going on, the nurse in the background said, “I’ll be back, I have a present for you!” She came back with this beautiful quilt “Happy Pinwheels” by Marilyn. They wrapped it around my daughter and told her that it was a magic quilt that has made her a princess. As you can see, she stopped crying, started smiling and began to laugh with the nurses. The whole atmosphere changed as they wheeled her away to the operating room. 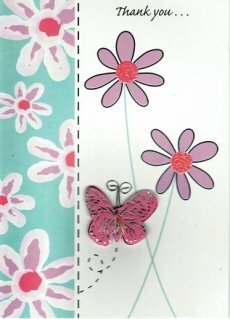 I believe the “magic” the nurse referred to is the Love that is put into the quilts by their maker. 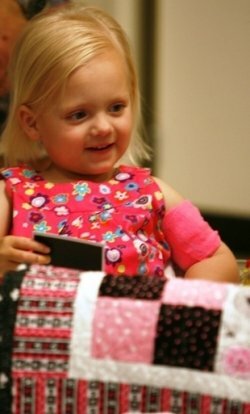 Quilts for Kids was able to comfort my child when I could not physically be there with her. It touched my heart to receive from an organization whose purpose is to do exactly what I witnessed. Thanks so much for your very kind note. 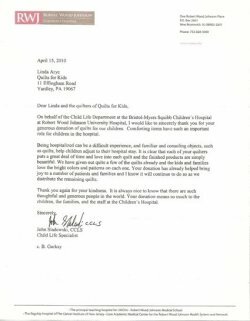 Please know that we are most appreciative the time you, Dean and others at Quilts for Kids have dedicated to brightening the lives and days of children in hospitals across the country, and for your very kind visit to our Bristol Myers Squibb Children’s Hospital here at Robert Wood Johnson University Hospital in New Brunswick, NJ. 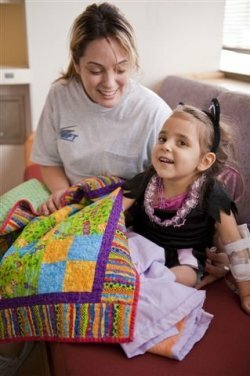 Your thoughtful and caring mission aimed at brightening the days of our pediatric patients is most commendable and we appreciate the commitment of time, energy and quilts to helping our pediatric patients. Please let me know when you and Dean are next planning on bringing quilts to the New Brunswick area hospitals and I will make sure to arrange my schedule to meet with you and your colleagues from Quilts for Kids. We are most grateful and appreciative of the caring mission you and Quilts for Kids have undertaken for the children and we will certainly let you know about a child who would benefit from a quilt from Quilts For Kids. 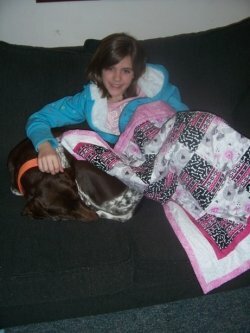 A dog lover, this young patient loved her aptly themed quilt! Now that she is home, Ally shares the comfort of her doggie quilt with her own four-legged friend, who has her own health issues with epilepsy. “On behalf of the UC Davis Children’s Hospital, the Child Life Department, and the children and the families we serve, we would like to offer a heartfelt thank you for your fabulous donation! The quilts, dolls, bags and fabric checker boards will offer joy to many of the patients here at the hospital. Hospitalization can be a difficult and uncertain time for children and their families. The Child Life staff at UC Davis Children’s Hospital strives to reduce the stress and anxiety of hospitalization by providing a comforting and caring environment. Donations such as yours play a vital role in this process. It was a pleasure having the opportunity to meet with you when you brought by the donation. The children have been delighted with the items. The smiles on their faces are immeasurable. What an honored gesture to have you place this donation in memory of Dr. Halsted. We recently received this e-mail from the NICU - Bereavement Coordinator, Thomasine Farrell. 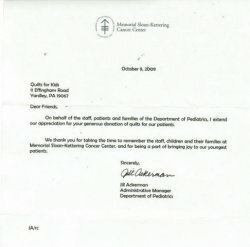 I am the Bereavement Coordinator at Childrens Hospital of Philadelphia in the NICU. I wanted to express our gratitude for your organization’s donations of small sewn blankets, booties, hats and stuffed animals. I am guessing that they were donated quite some time ago and I often do not receive them in our unit for a while. I want you to know that we use everything donated to us for the purpose of creating warm and gentle memories for parents as they hold their dying infants. Without donations such as yours, we are limited to having the infants dressed in hospital issue gowns and blankets. This is not ideal and we are so grateful to receive your beautiful donations. While in the hospital, Kate’s stuffed animals were temporarily lost in the wash. 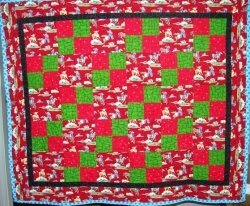 When she got back to recovery, her animals were returned ... along with something new ... one of our quilts. I wanted to thank you for the amazing gift of the quilt. I was in CHOP Tuesday August 5th until today and after my second surgery to remove my gall bladder I recieved a blanket. It is an amazing quilt and I appreciate the donation. They lost my stuffed animals temporarily in the wash when I got back to the recovery room and when they found them they also brought the quilt. Thank you so much to the people who make them. A thank you to P. Johnson. Kate received a quilt made by P. Johnson which was multi-colored with split rectangles. 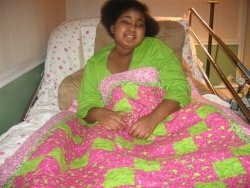 Jessann, who comes to Chop every three months, received a quilt during one of her stays. My daughter comes to CHOP every three months for surgery for an airway disease. While there in March of 2008 two of the wonderful nurses, Midge and Maryann gave my daughter a beautiful handmade quilt… It was all her favorite colors and it really made her feel special. God bless all the staff at CHOP and to all the wonderful people at Quilts for Kids for brightening up what is sometimes a very gloomy day for my daughter. PS. 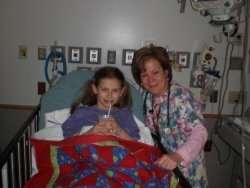 I have enclosed a picture of her at the hospital after her surgery when the nurse gave her the quilt..